Having ones tonsils removed is a relatively common procedure for children. Going to hospital is not a pleasant event and may bring up many fears, especially for a child. 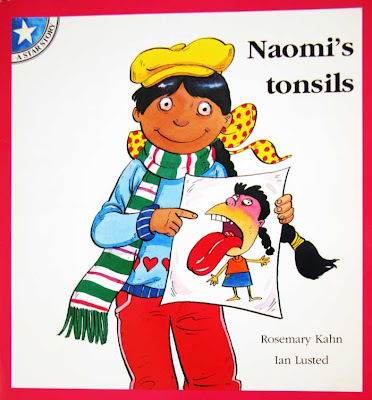 In order to ease the process, Rosemary Kahn has written a book, entitled Naomi's tonsils to help explain to children what to expect. To verify any medical facts that are relevant to the book, Rosemary Kahn interviewed Ear Nose and Throat Specialist Dr Paul Crossland who practises from the Vincent Palotti Hospital in Cape Town, South Africa. The book is written in easy English to enable those children who are able to read, to read the book for themselves. Naomi's Tonsils is illustrated by Ian Lusted and has been published by Jutas as one of their "Star Story Books".